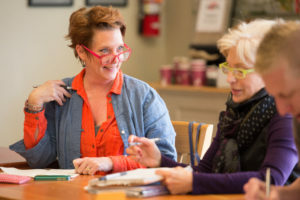 Write Around Portland provides high-quality, participant-centered, creative writing workshops. Most of our workshops run for ten weeks, two hours per week. The workshop curriculum focuses on experiential learning, generating new writing and building on the writers’ strengths. Workshop participants write stories, poems, memoirs, letters and essays while experimenting with imagery, character development, dialogue and early-draft revision. 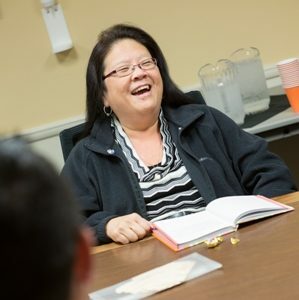 To build community through writing, our workshops are facilitated by extensively-trained volunteers who write and share alongside participants through a series of freewrites and positive, strength-based feedback. Learn more about the variety of workshops we offer: Traditional Writing Workshops, Prompt at Powell’s, Writing Workshops at HOTLIPS Pizza and Workplace Workshops. We hold free writing workshops for adults and youth in hospitals, schools, treatment centers, correctional facilities, homeless shelters, low income housing residences and other social service agencies (list of previous partners). To ensure everyone has access to writing in community, we provide journals, pens, bus tickets, childcare and snacks for participants in these workshops. Interested in bringing a Write Around Portland workshop to your agency? Call 503.796.9224 or fill out our contact form. Interested in joining a traditional workshop? Fill out our participant info form. Write with us and help support the communities we serve! Proceeds from the workshops below help support Write Around Portland’s free traditional writing workshops in low-income housing communities, correctional facilities, hospitals, schools, treatment centers and other social service agencies. 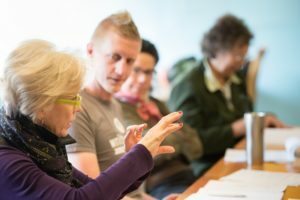 Write Around Portland offers unique workshops designed for writers and aspiring writers who want to participate in a Write Around workshop and support the communities we traditionally serve. Prompt at Powell’s is your chance to write in community with others following the acclaimed Write Around model. Registration required. Session #1: 10 Mondays, Jan 28 – Apr 1, 2019 – Registration Closed. Session #2: 10 Tuesdays, Mar 19 – May 21, 2019 – Registration Closed. Fee: $300 (Payment plans available.) Fee includes snacks and access to the “bowels of Powell’s.” (Accessing the “bowels of Powell’s” requires climbing a flight of 12 stairs). Click here for more details about Prompt. The Prompt Alumni workshop will feel like an expansion of one’s previous Prompt workshop experience. Think of it as Prompt “plus” in partnership with the Independent Publishing Resource Center (IPRC). Participants will still generate new writing together. The difference will be felt in the expanded writing exercises and the opportunity to focus deeply on re-(vision) activities. The final two workshops will take place at the IPRC studio where participants will receive instruction on how to design and produce their own risograph prints of their work. Fee: $350 (Payment plan available.) The additional $50 covers studio time, additional instruction and materials from IPRC to design and produce your own risograph prints. *Only open to returning Prompt participants. Click here for more details about the Prompt Alumni Workshop. Our writing workshops at HOTLIPS Pizza are perfect for both the new and seasoned writer. Start your day with the written word and delicious pastries, coffee and tea provided by Grand Central Baking Company. Attend one, attend them all! Workshops are held 3rd Thursdays and most last Sundays from 9-11am. Location: HOTLIPS Pizza, 2211 SE Hawthorne Blvd. on the TriMet #14 bus line. Fee: $10-$30 sliding scale, per workshop. Please bring a journal or notebook and a favorite pen. Register online now. Bring a Write Around Portland workshop to your workplace, company meeting or other group event. Our workshops have been the medium for staff retreats, team-building seminars and developing communication skills. We can also adapt the curriculum and duration to meet your needs. Let us know what you’d like and we’ll see what we can do. Learn more here.